I've been on a few little adventures in the last couple of weeks. First, I was invited on a spontaneous road trip to Loch Sport where I hung out near a beach and a lake and got a little sunburned. There was lots of junk food and drinks. Good times were had. The weekend just been was spent at Phillip Island with two of my best mates from uni, significant others included. Of course, our thesis results were FINALLY released as we were driving there, and I am happy to brag that I did amazingly (I literally pulled over to check my results)! It was not great beach weather, but we went to the wildlife sanctuary where we hand fed some wallabies, kangaroos, and ill mannered emus. And all weather is good weather for a chocolate factory visit (note: do not leave chocolate in a car on a hot day). And the Penguin Parade. It's not a trip to Phillip Island without the Penguin Parade. Look at the cute little pademelon and its baby! Squee! Finally, today I spent a couple of hours bush walking in the Dandenong Ranges with the bf. It was supposed to be a 7-8km hike, but we were rudely interrupted by the sound of distant evacuation sirens which we only determined was a nearby school doing a fire drill AFTER heading back to the main picnic grounds to see if there was a need to leave. Better safe than sorry. Still a fun day. I need to pull my finger out and start writing things now, get out of holiday mode. My honours supervisor and I are writing an academic paper for a peer reviewed anthology together for fun, but I know it's going to be a bit more work than I've put in so far and I want to do my best. Also, back to general writing endeavours. I NEED to write/edit things. What have you guys been up to? How are your NaNo projects and other WIPs? 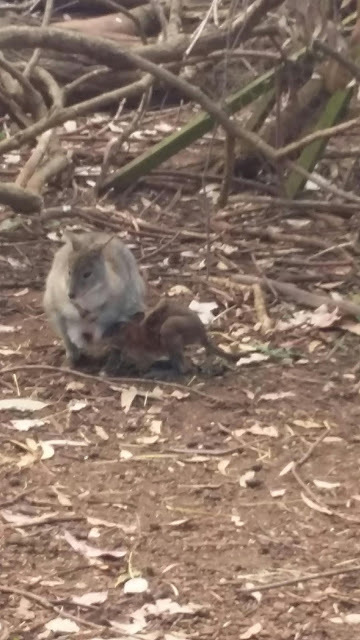 Never heard of a pademelon before. Very cute. My latest WIP is no longer in progress as today is publication day! That's cute. I'm going to have to look it up. Sounds like a really enjoyable couple of weeks. Thanksgiving slowed me down a bit on my RiP (mainly due to effectively burning two days on driving the Catbird from/to school) but I'm about ready to send it back to my agent, yay. Have fun with this next project! Patsy--they're in the same family as kangaroos and wallabies, very adorable. Thanks for stopping by. Andrew--indeed they are, thanks for visiting. So you know how I said I finished uni ...?